Getty Images/PoolPresident Donald Trump and House Speaker Paul Ryan. Republicans are banking on an economic boost from their massive new tax law as a part of their 2018 midterm strategy. 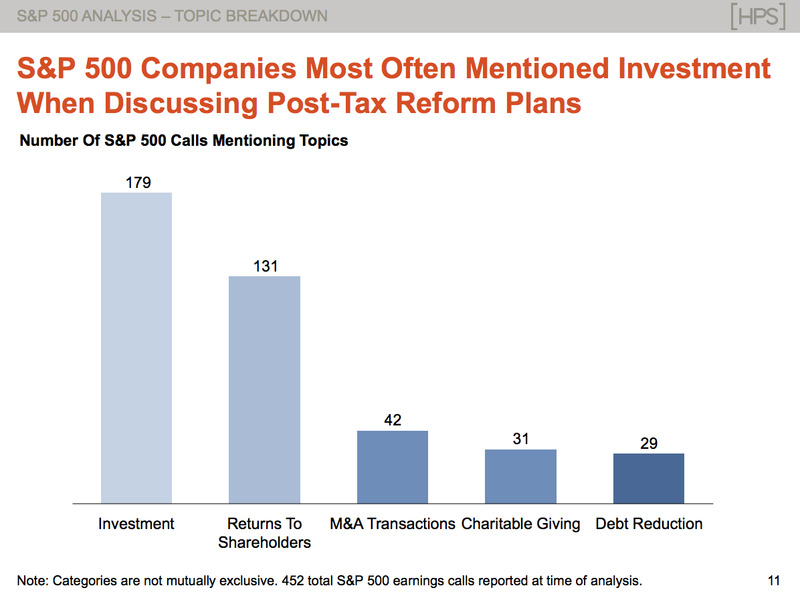 According to a new analysis, 84% of S&P 500 companies talked about the new tax law on their fourth-quarter earnings call. Of those, 179 said they planned to invest savings in workers or new equipment, the analysis found. This is good news for the GOP, as new investments could help drive economic growth. 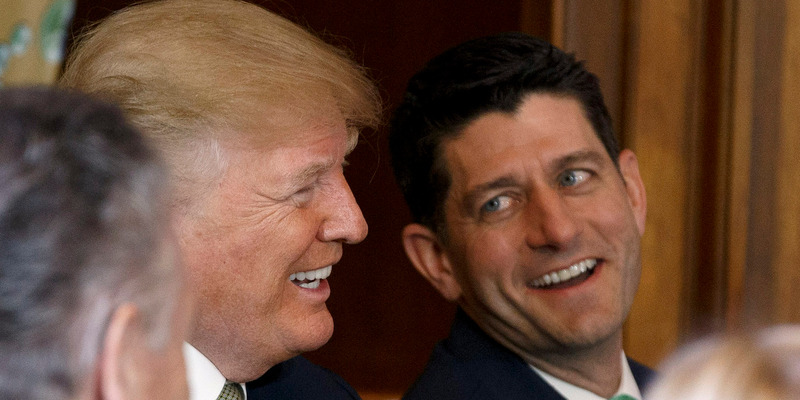 Republicans have staked their 2018 fortunes in large part on their signature legislative achievement under President Donald Trump: a massive overhaul of the federal tax code, which they said would lead to an economic jolt from increased business investment. A new analysis of public statements from some of the country’s largest companies may back up that argument. 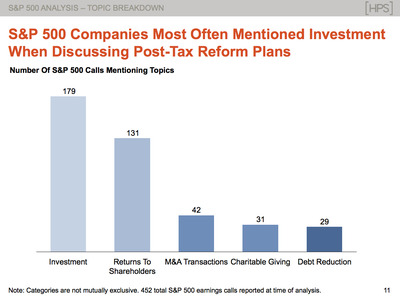 Conducted by the public-affairs firm Hamilton Place Strategies, the analysis of 452 fourth-quarter earnings calls from S&P 500 companies found that 84% brought up the tax law. 179 companies talked about using the savings for investment, like new equipment or increased wages. 131 talked about returning some of the gains to shareholders in the form of dividends or buybacks. 42 talked about new merger-and-acquisition possibilities. 31 talked about contributing more to charity. 29 talked about paying down debt. Of the companies that talked about investments or returning money to shareholders, 45% told analysts they planned to do both, according to the analysis. Thirty-nine per cent spoke exclusively about investments, while 16% talked only about buybacks and dividends. 157 of the 179 that talked about investments said they would spend money on capital expenditures. 55 said they would pay employee bonuses or increases wages. 50 mentioned increases in other employee benefits. The way the firms are talking about deploying their savings should come as good news to Republicans. Other data has not been as encouraging for the GOP. Polls have found that workers have still not noticed an increase in their paychecks. And capital-expenditure expectations have so far not picked up. The analysis doesn’t measure the relative allocation of the new savings. As Democrats have consistently argued, since the tax law’s passage, the dollar amount of buybacks initiated by companies has far outpaced wage increases and one-time bonuses for workers. On the other hand, substantive pay boosts and building new equipment takes a bit longer than buyback announcements.